Vessel Jeanneau Cap Camarat 7.5 WA named CORRECAMINOS BEEP BEEP has been manufactured in 2014. We offer this boat from base Sant Antoni de Portmany in region very close to Ibiza. CORRECAMINOS BEEP BEEP is registered for 7 passengers. Layout of the sailing boat is 7. Jeanneau Cap Camarat 7.5 WA CORRECAMINOS BEEP BEEP is equipped with 1 bedrooms. For guests disposal there are 1 toilettes. You can fill the tank for fuel with 285.00 l l. and in water container it goes even 100.00 l l. With engine 225 hp CORRECAMINOS BEEP BEEP can sail really fast. CORRECAMINOS BEEP BEEP is 7.42 meters long and 2.55 m wide. Depth is 0.55 meters. 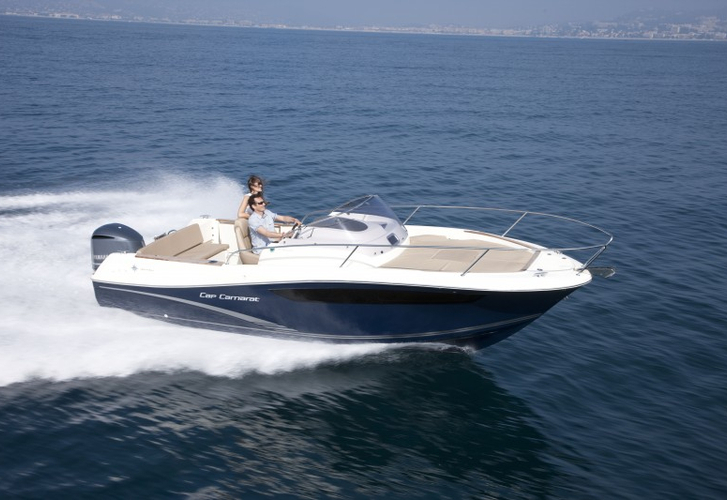 You can search different boats following this link: Motorboats Sant Antoni de Portmany. Yacht's equipment involves : Bimini top, Gps plotter, Radio / cd player. . Security deposit accounts for 1000.00 EUR. Choose our offer and have fun on the deck of CORRECAMINOS BEEP BEEP. This Jeanneau Cap Camarat 7.5 WA from Sant Antoni de Portmany from Balearics Use the search engine for search for in this site: Motorboats Balearics.